Weekends in Accra can be very busy, or very long. I find it very quiet when my husband is not here, but have gotten back into reading and knitting (oh, so exciting). And cooking, of course. Cooking for myself is something I know I should embrace with more gusto, but it is much more fun to cook for others. Fortunately there are friends who are great company and who like to eat, so here is a recent Sunday lunch. I’d brought down a broccolo romanesco, that beautiful vegetable. How to best enjoy it? 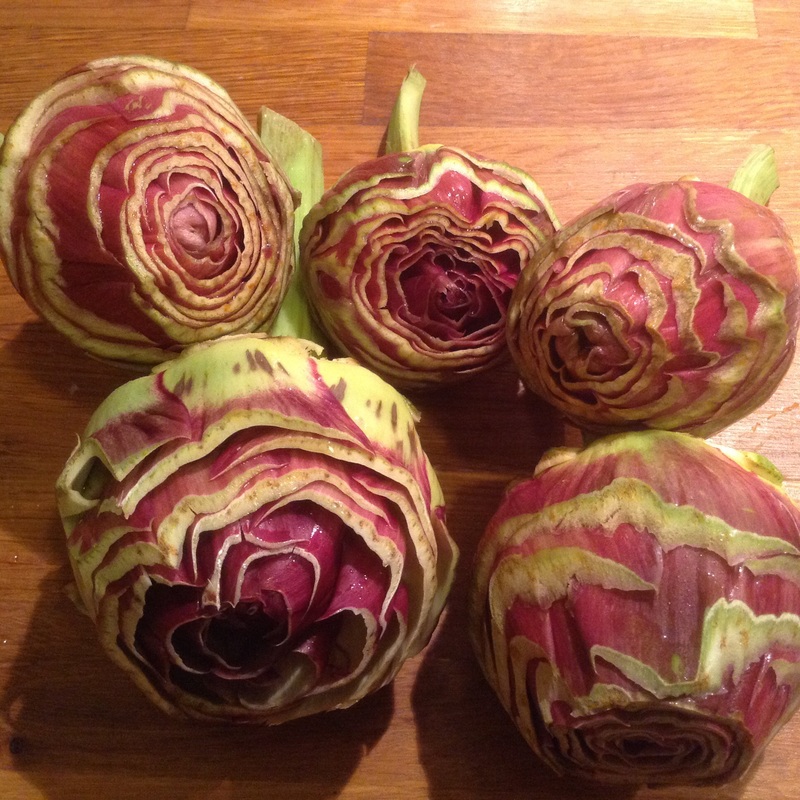 Wash the broccolo romanesco, and cut it into florets. I took off the coarsest part of the core, and tossed the rest in. Boil them in salted water until tender, 8 minutes or so depending on the size of the pieces. You’ll want it quite tender. Take the broccolo out and keep it aside, but SAVE the hot broccolo water, as you will boil the pasta in it. In the meantime, heat the olive oil in a frying pan and gently fry the garlic. Squeeze the sausage meat from its casings and fry it with the garlic until cooked through and crumbly. Add a splash of white wine, and a pinch of peperoncino (chilli flakes). Add the broccolo and gently mash the bigger pieces, so they almost become sauce, it should be moist. You can prepare this in advance and then go have a glass of white and some antipasto. Accra has been lovely and cool (26C, so we sat outside). When about ten minutes away from eating : bring the broccolo water to the boil again (yes, it will be green) and tip the pasta in, with a little more salt. Cook the pasta to al dente and keep a cup or so of the starchy pasta water aside when draining it. That will go in with the salsiccia and broccolo when it is tossed with the pasta, to loosen it a bit. Salt and pepper to taste. Add grated cheese generously and enjoy! Note: you can definitely make this without the salsiccia, just with the broccolo and grated cheese. Very nice with, though. I’m down to eating meat 1-2 times a month here, so it needs to be good. This pasta served for with two small leftover boxes for me. I’d made a pizza with broccolo romanesco and salsiccia in the past, also very nice. The grana padano block of cheese lives in the freezer, and is very easy to grate even when frozen. It was an excellent afternoon: South African white wine, Roman salami, fresh flatbreads and ricotta di capra con tartufo, then this pasta and grilled radicchio, and a plum/peach cake with ricotta. And good conversation, of course. It was nice to share the bounty after traveling. Now I’ll be debating what I can cook with more locally sourced materials. Availability of Ghana-grown vegetables is getting much better, so I am thinking of a rotolo stuffed pasta dish with greens and tomatoes. Maybe for the next lunch? PS why would someone bring pasta from Italy? Because it is expensive here! 9.99 cedi for Barilla is not bad (1.8 euro, 2.1 USD). However, I haven’t bought Barilla pasta since their chairman’s homophobic remarks in 2013. Apparently that has since improved, so I may reconsider to see how it compares to the West African Tasty Tom pasta. I’ve seen a few recipe for jollof spaghetti here (Nigerian) and here (Ghanaian – with canned beef, urrrgh) so that will be a future dish to try. This entry was posted in food and tagged broccoli, living in Accra, pasta, sausages on August 19, 2018 by krumkaker. Spring is in the air, it’s pollen season already and yesterday I came home to find my husband in shorts (well, he is English). Though the rain is bucketing down tonight, winter seems to be on the way out, and I feel like packing away winter jumpers soon. Oranges are cheap and wonderful, the artichokes are still good and some terribly early strawberries have been observed. We were having Sunday lunch with visitors at Tanto per Magna, an excellent Garbatella trattoria, when I saw carciofi ripieni being carried to a nearby table. Stuffed artichokes: hmmm, interesting! Here’s our attempt to recreate that. Buy your artichokes already cleaned from your friendly neighbourhood fruit and veg guy. Otherwise, get a small sharp knife and cut them down so the prickly outer leaves are removed. Cut off the stem as well (that is edible so save it for something else.) Boil the artichokes upside down for 10-12 minutes (you might need to weigh them down with something to stop them turning right side up.) Test with a knife to see when they start getting tender. Take them out, let them cool slightly, then scoop out the thistly bits in the centre with a sharp teaspoon. Try to keep them roughly intact, not always easy. Put them together in an ovenproof dish. In the interim, crumble your sausages into a frying pan with a little salt and pepper and the onion, and cook them, draining off fat of needed. Tip into a bowl, and add breadcrumbs and cheese. You could add an egg to bind it, but ours held together well anyway. Stuff each artichoke with as much of the cooked sausage stuffing as you can, then bake it at 200C for 10-15 minutes. Note: We should have cut these down further at the top before cooking them, maybe 1-2 cm more, as they were still quite bristly after being cooked. Very nice flavour through! 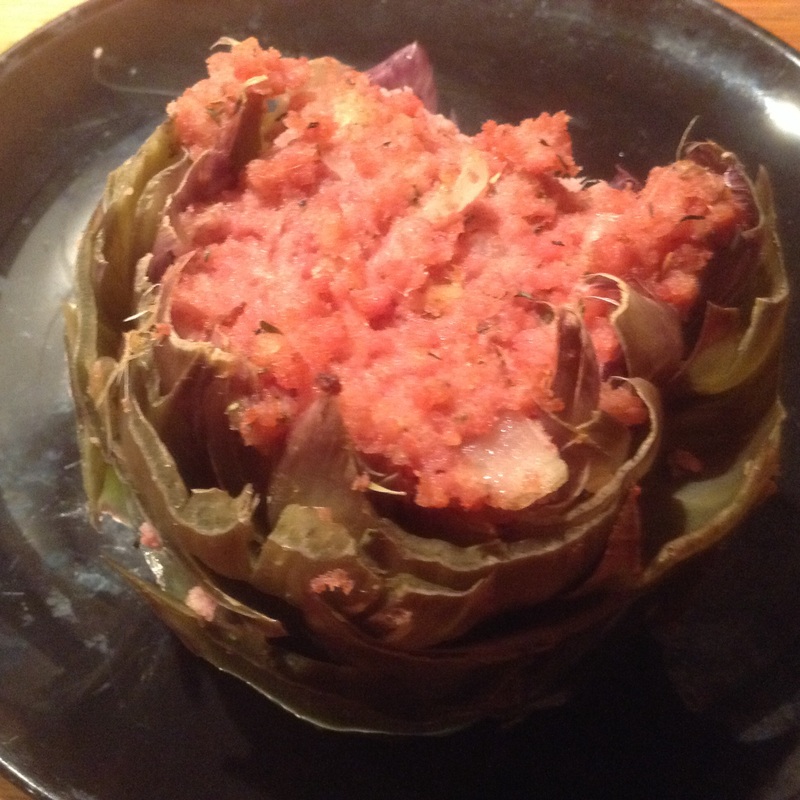 Next time I’d probably just enjoy the carciofi boiled without stuffing them, but it was fun to try something new. Might be nice to try these stuffed with mushrooms and breadcrumbs and the artichoke stems, with a little cheese on top. 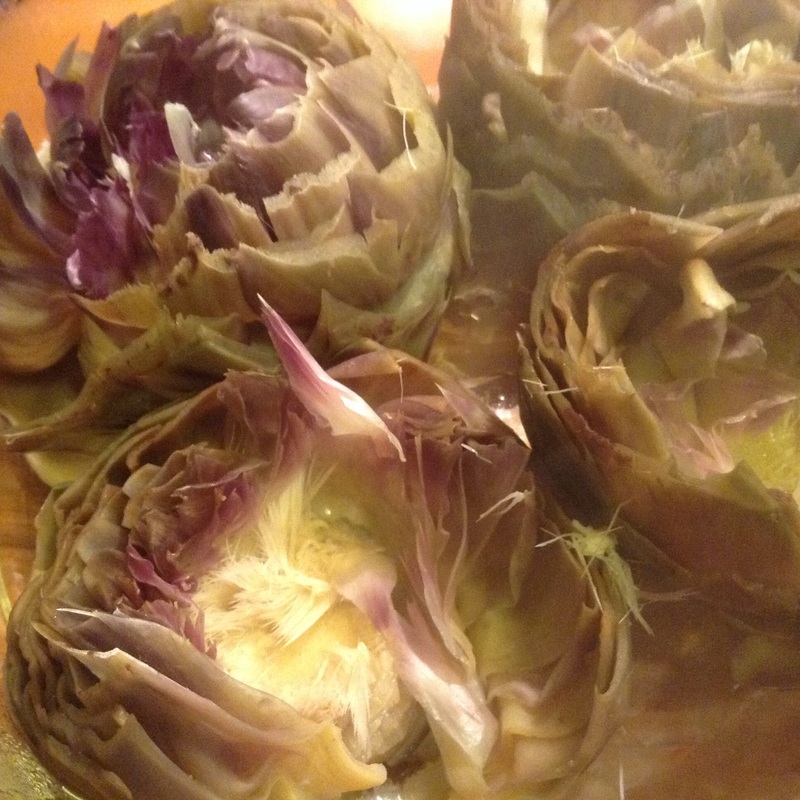 This entry was posted in food, Rome and tagged artichokes, sausages on March 4, 2015 by krumkaker.